SM Fashion Hall has become a fashion and food destination, making it one of my favorite go-to malls because it’s got almost every store that tickle my fancy. 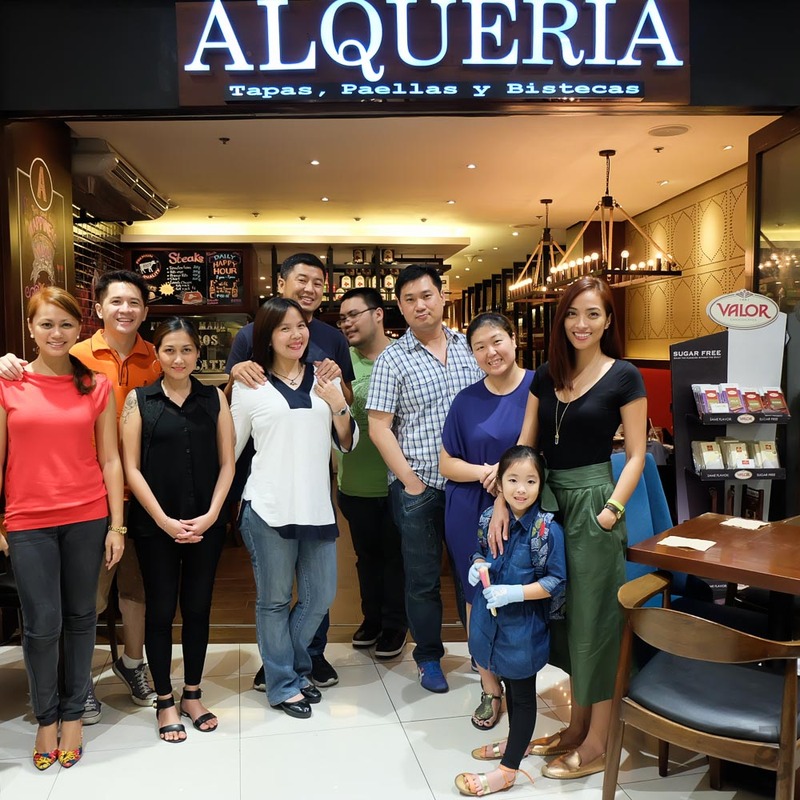 Recently, I was invited to try Alqueria, a Spanish restaurant under the SumoSam group of restaurants. “Alqueria” is an old Spanish term referring to a type of farmhouse that resembles a small castle and once served as home to many rural families in Spain. Today, Alquerias have been converted to social gathering places. Such an interesting fact. Hmmm, in my future house, I’ll allot an area for my private Alqueria. Heehee. Its Executive Chef, Chef Chris Oronce gained extensive experience in food and restaurant operations management working at distinguished restaurants in the US, like MGM Grand Shibuya and working with celebrity chef Bobby Flay at Mesa Grill Caesar’s Palace in Las Vegas, among others. 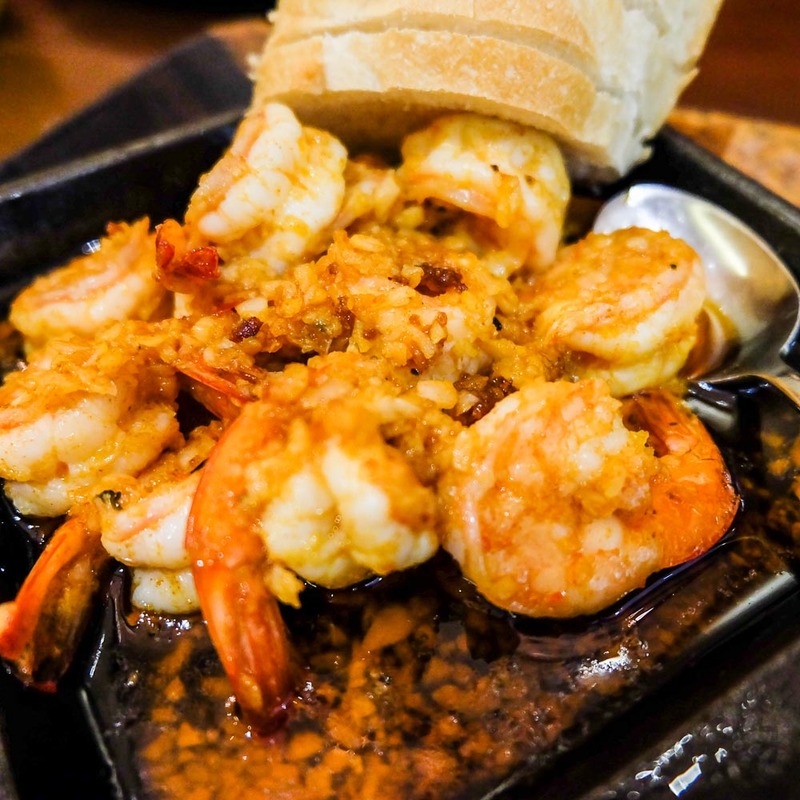 Chef Chris works closely with Alqueria Head Chef, Chef Roland De Gracia and the pair has come up with dishes that showcase the different flavors of Spain. 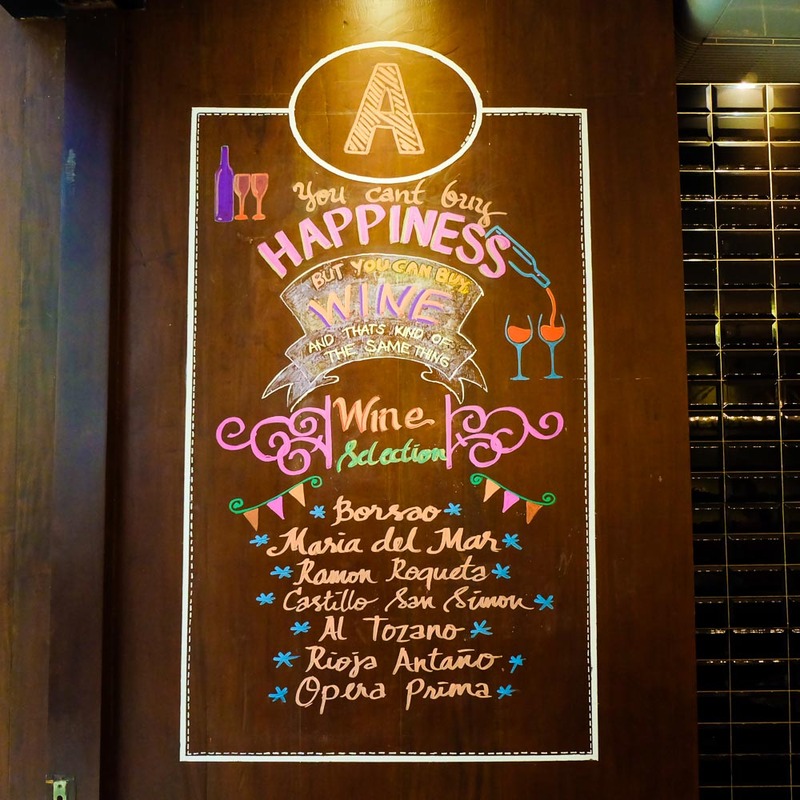 Such festive yet warm and cozy ambiance Alqueria offers. 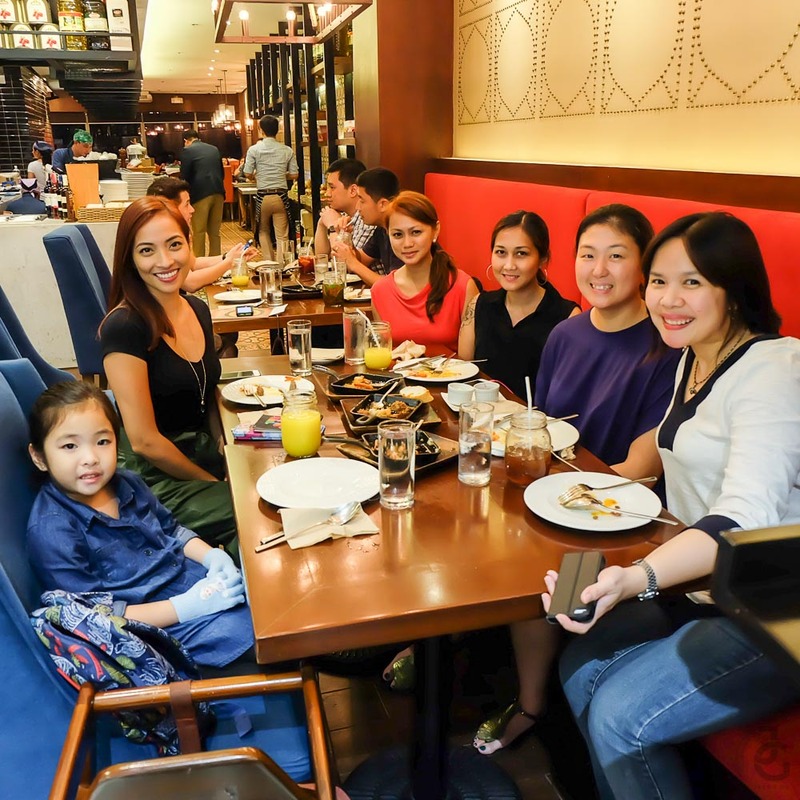 It’s a good family restaurant that’s specializes in paellas & prime selection of tapas & bistecas. 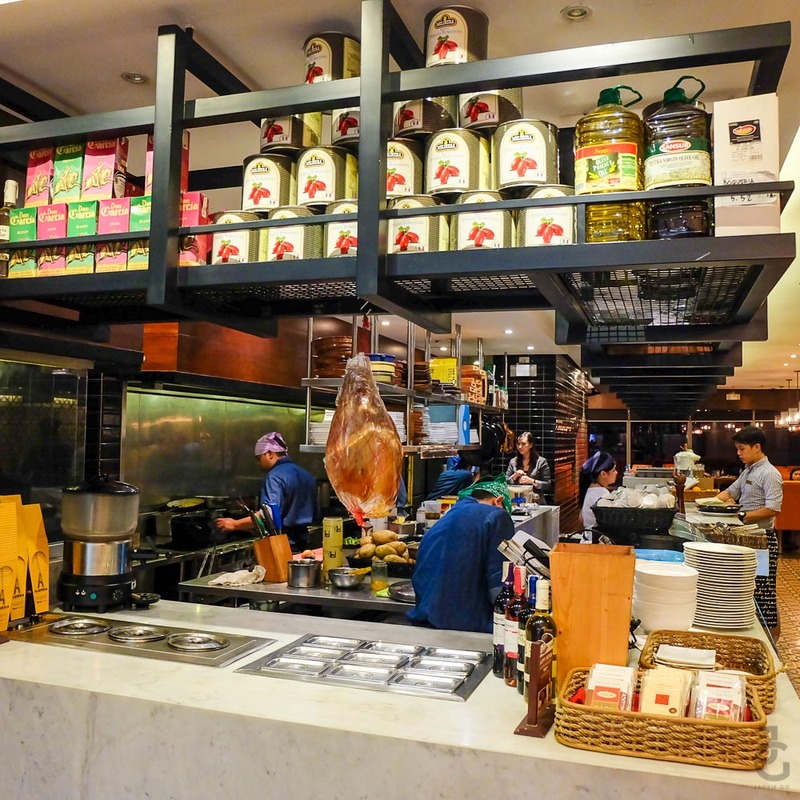 The open kitchen lets you see all the action happening to prepare your food. Tapas Trio which I highly recommend you order. 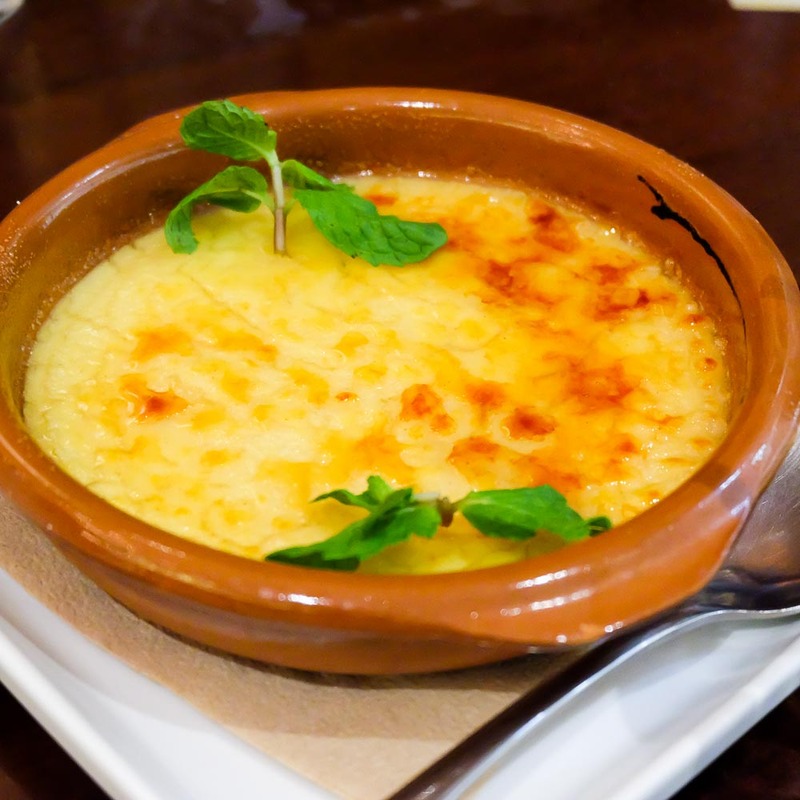 Octopus gratin topped with mashed potatoes and manchego cheese. 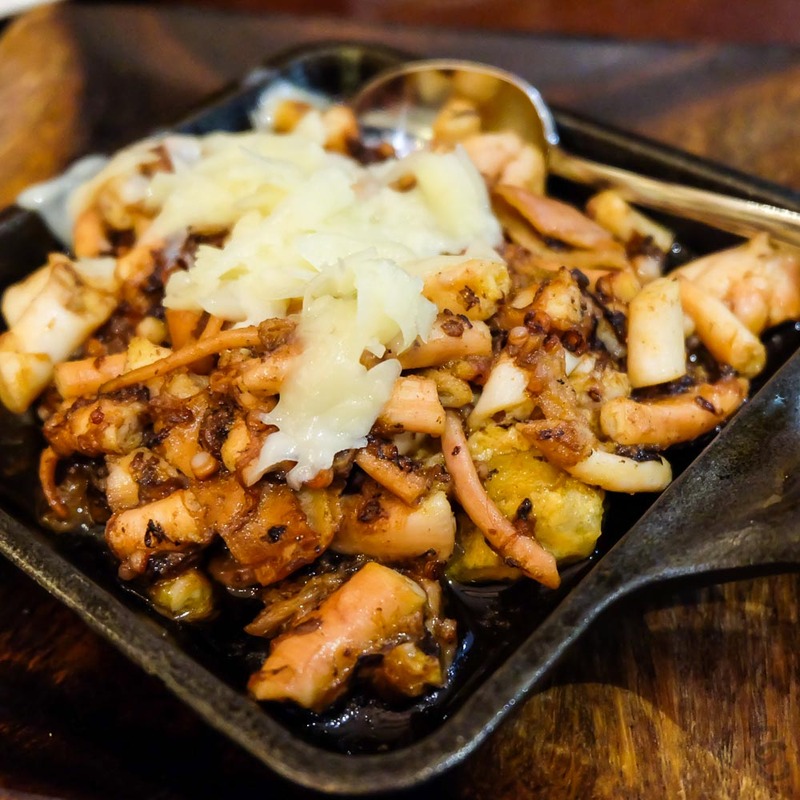 Tender octopus that goes so well with the manchego cheese. I was so tempted to order plain rice because it’s that good. 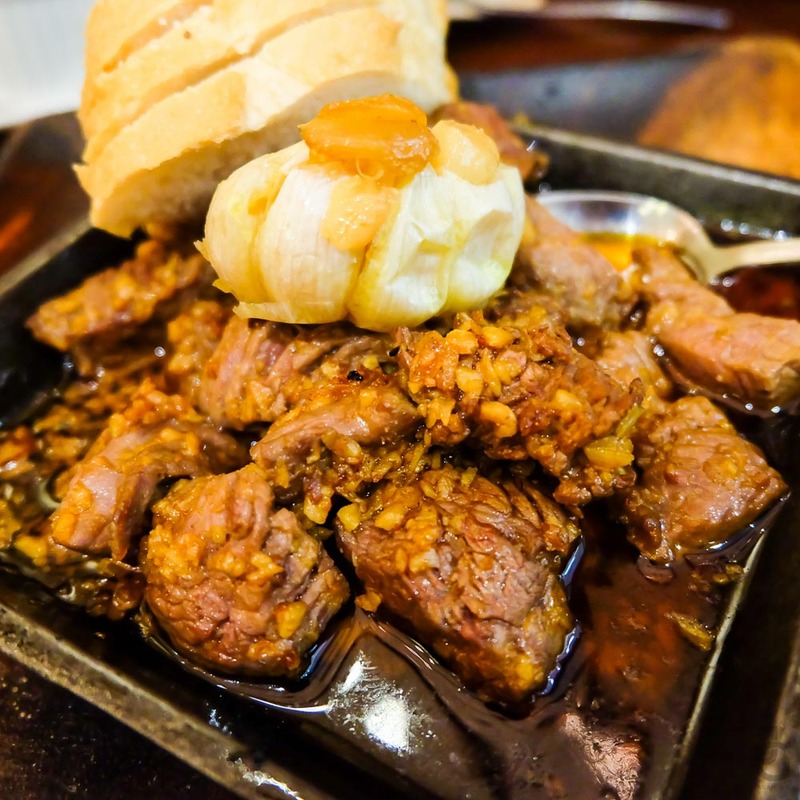 Cubes of sautéed imported tenderloin marinated with garlic, Spanish paprika and olive oil. 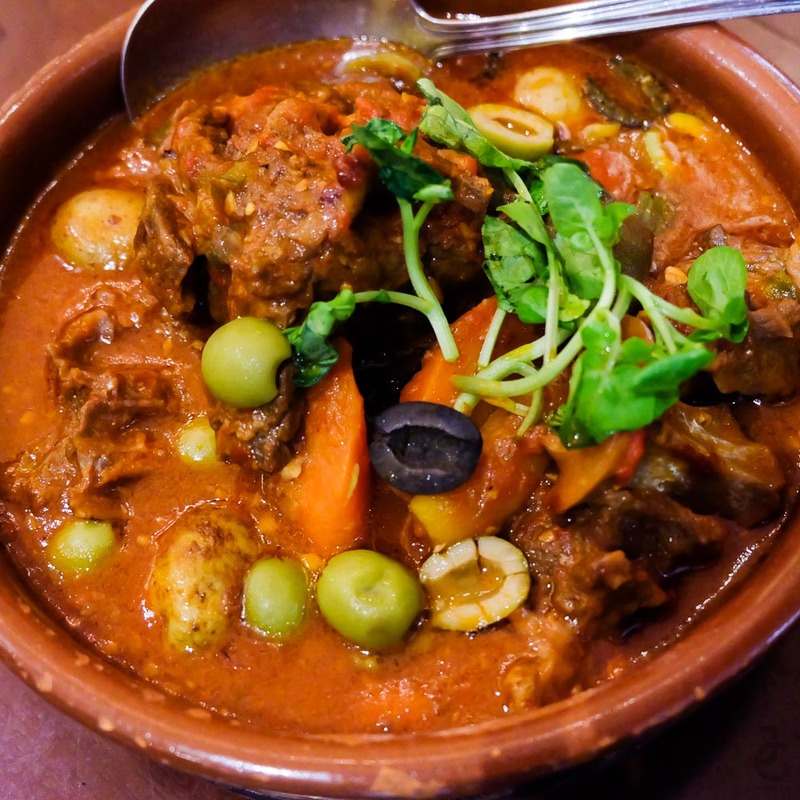 If you like garlicy food, then Alqueria’s Salpicao is perfect for you. It’s not salty so you’ll taste the milky flavor of the tender meat. 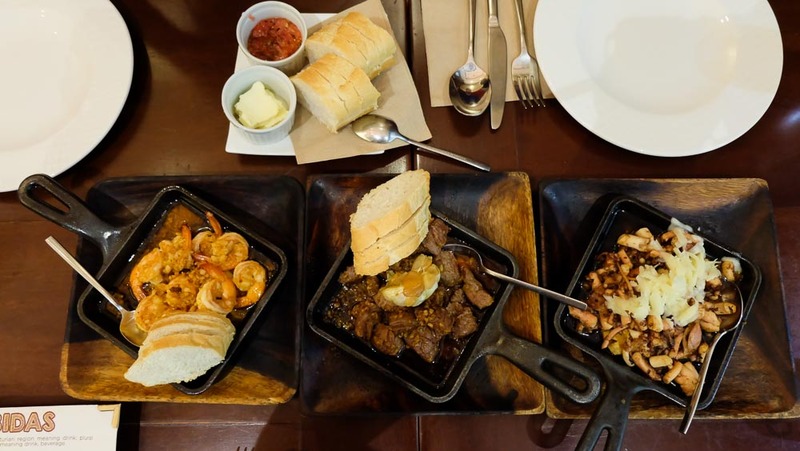 A Spanish restaurant won’t be complete without paellas! 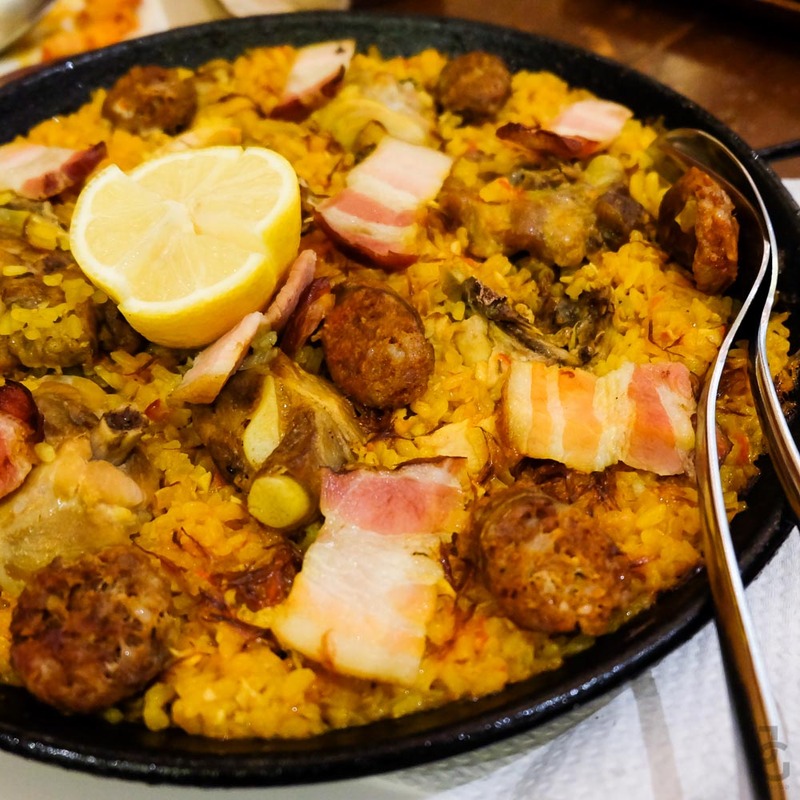 While almost all Valenciana have similar toppings, the rice really makes the difference. 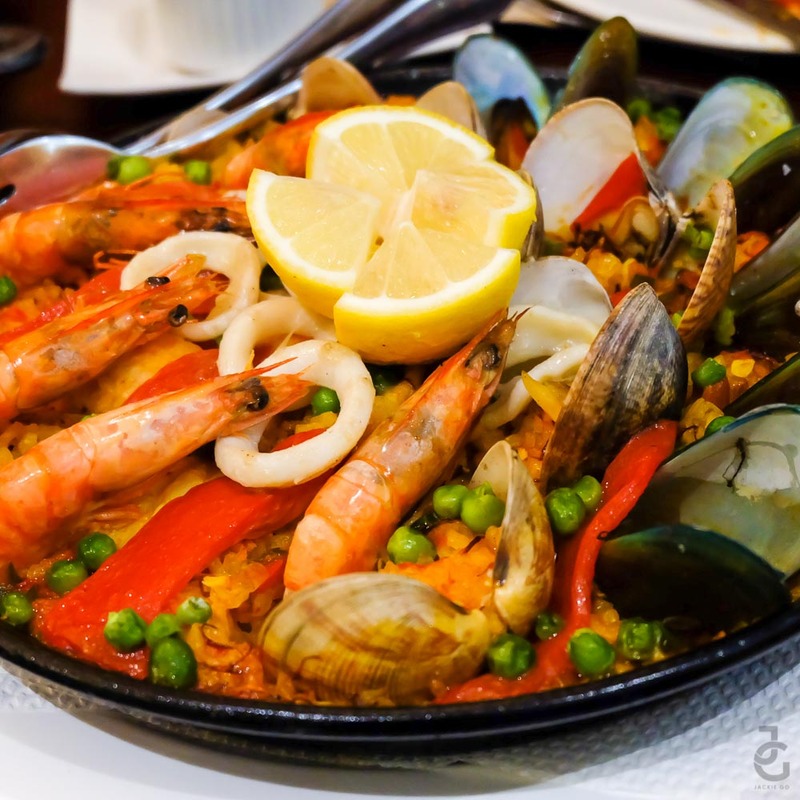 And I like Alqueria’s Paella Valenciana because the consistency of its rice is just right – it is not fluffy (buhaghag) that it feels dry nor is it soggy (malata) that it feels pasty. Simmered rice in saffron-infused stock topped with chorizo, chicken, smoked bacon and pork spareribs. 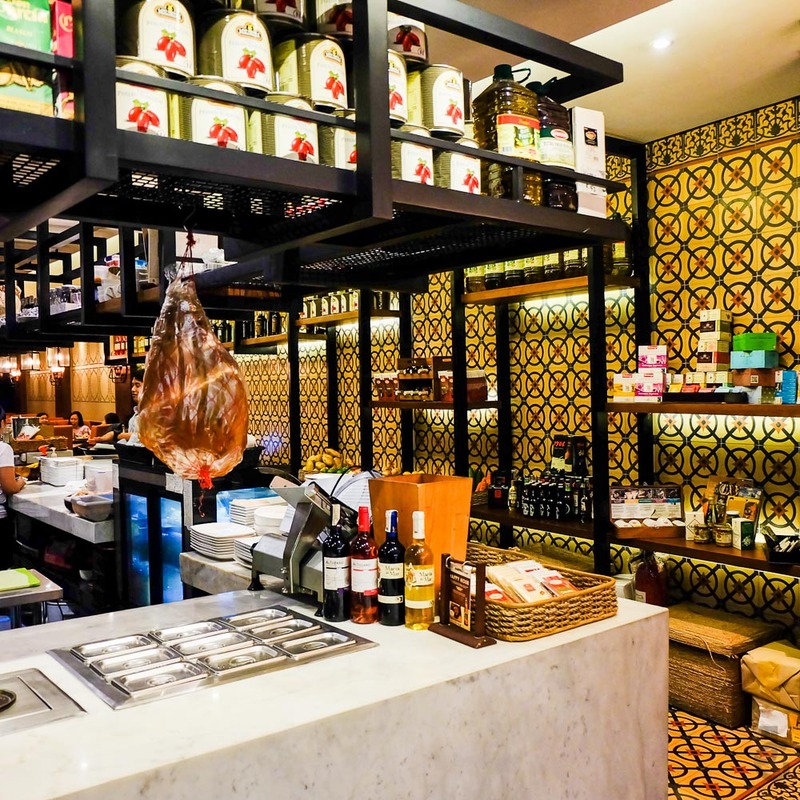 For the meat lovers out there, Alqueria’s got you covered with their Paella del Carne. It was good but I prefer Paella Valenciana instead. Maybe because I’m used to different textures and flavors to my paella. 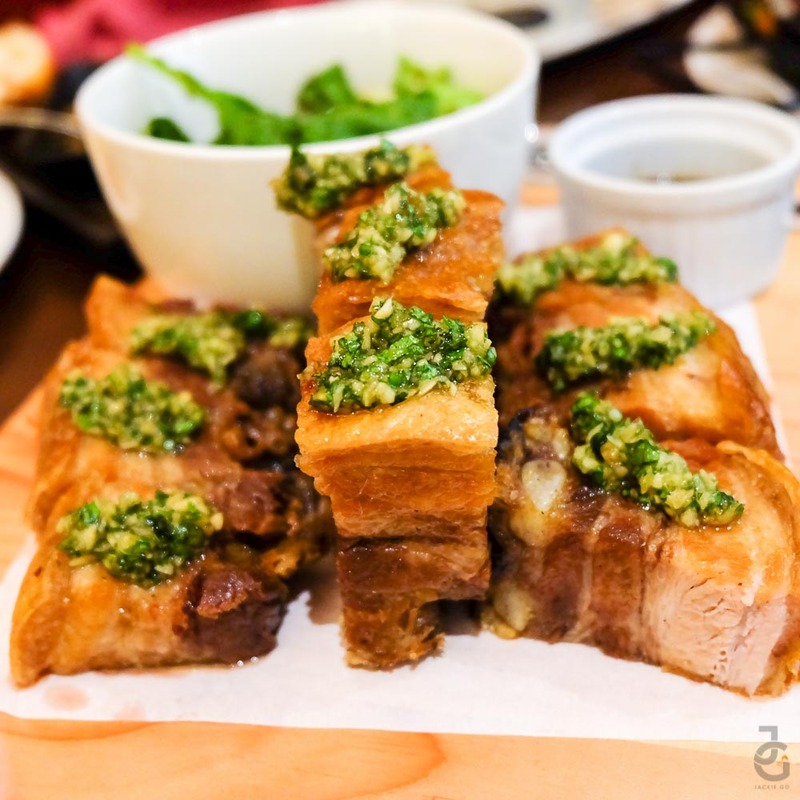 Pork belly slow roasted for 4 hours to achieve perfect skin crispiness and fork tender meat topped with our version of gremolata served with a side of fresh greens. Vientre Extra is probably one of the best slow roasted pork belly I’ve had. The marriage of crunchy, crispy skin with fork tender meat makes devouring this dish a delight. It doesn’t help that it’s severed with a side of greens, so I wasn’t able to help it and ate a lot. Grabe lang! I think I had 4 pieces of this – almost half its serving. This off the menu dish was served to us to try. 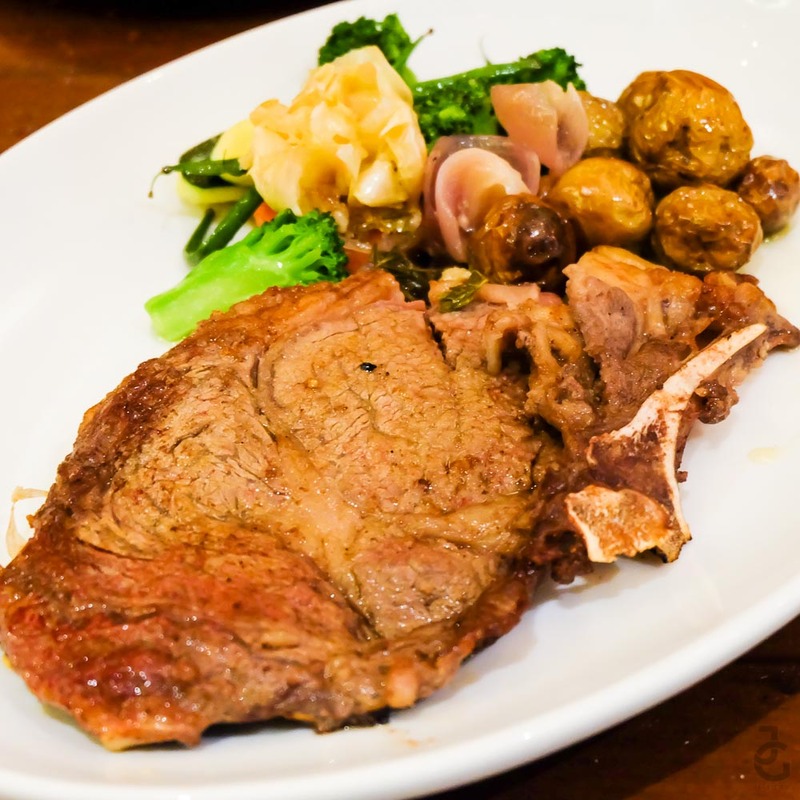 The meat was tender and I like the side vegetable that came with it. Although, I find the meat a bit bland for my taste. The ladies all smiles as we had our tapas for our appetizer. 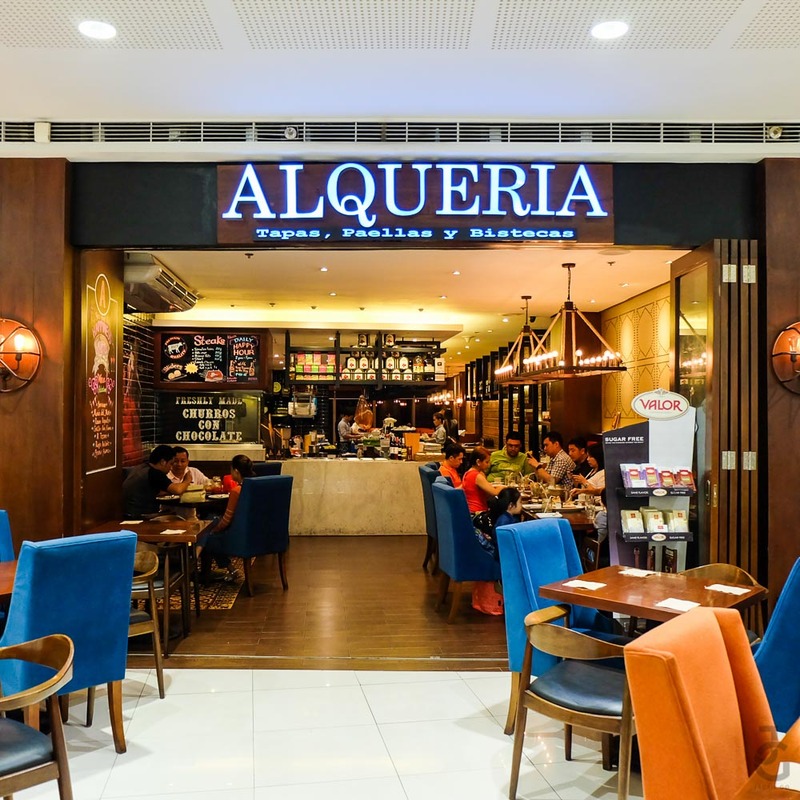 As for dessert – which is my favorite part of every meal – Alqueria had us try three of their best sellers. 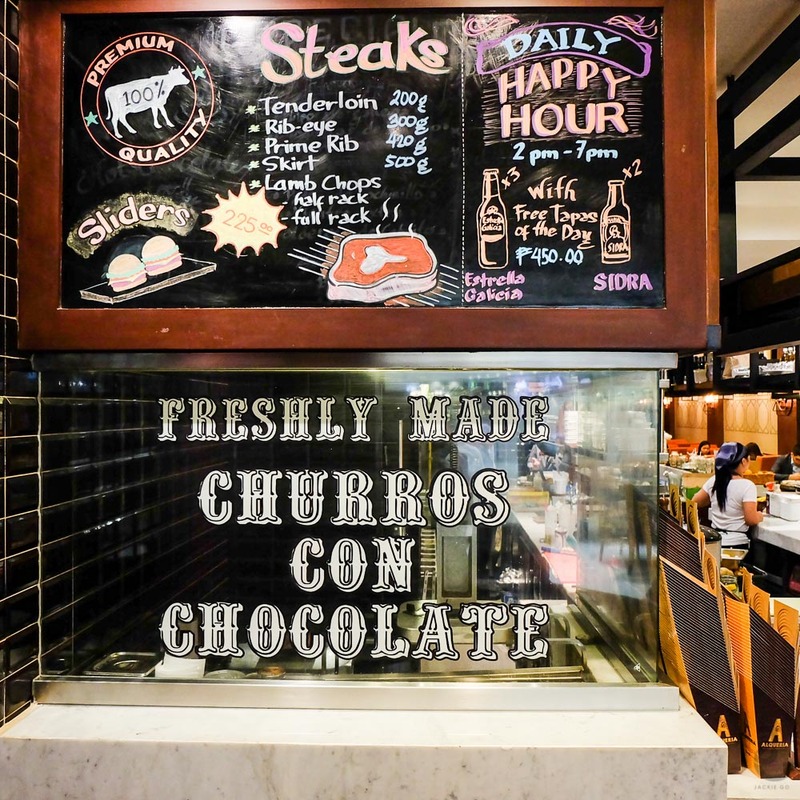 Alqueria Churros are made fresh daily. 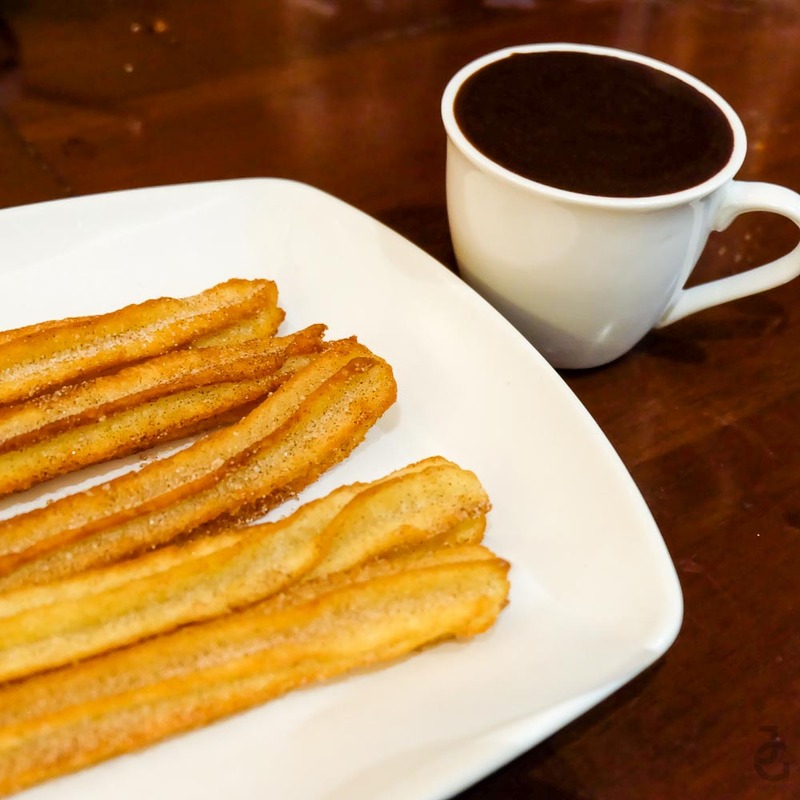 Their churros is dense but not oily so you won’t get satiated easily. Plus, the Valor dip gives the creamy contrast to the crunchy churros. A classic Spanish dessert made with custard and caramel sauce. Kinda like our local version of Leche Flan. It’s creamy and good but I suggest best to share this with someone. 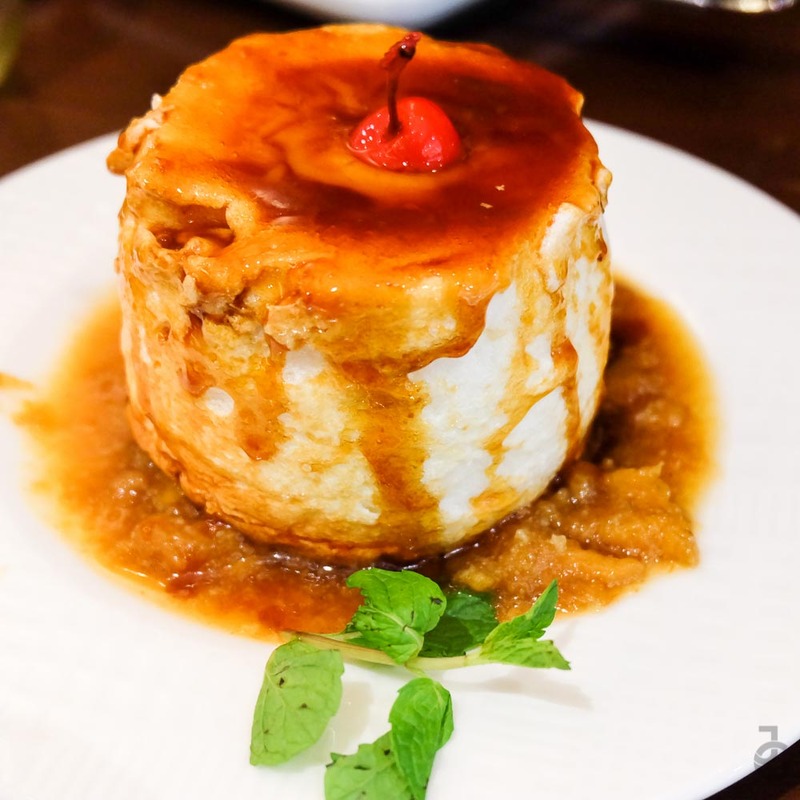 A Filipino version of the French dessert “ile flottante or oeufs a la neige, baked meringue with caramel and candied bananas. I admit, I’m not a fan of meringue but this Canonigo is an exemption! Fluffy centre that sits above a bed of candied bananas. And because I’m a fan of caramel, I loved it even more. This dessert is definitely for someone who has a sweet tooth.